1. Intimidation. I never thought that a team could intimidate another so much on home ice as the Bruins have done in this Cup final. I wonder what this series would have been like IF the Bruins had the better record, and therefore home ice. 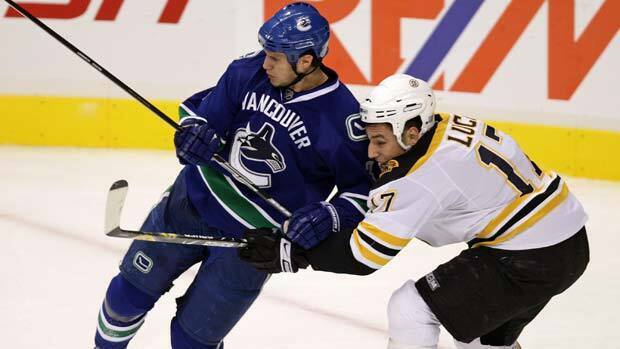 The Canucks seem timid in Boston and afraid of the corners. The Gold and Black will be out in full force tonight, Luongo better bring ear muffs. 2. Save It. Life has a funny way of coming full circle and sticking it's finger up your nose while asking you if you like it, when you get cocky and brash! Luongo should know that could happen in this series, and that starting a war of words with the other goalie (when that other goalie has been superior in this series) is just a bad idea. Goalies should be humble and quiet. The magical hockey gods have found ways to punish those who have not walked the fine line and heeded the words of those before them. Robby, go play the game and try not to give up more than 5 goals. You should not be worried about Thomas, you should be worried about your own demons. 3. One Hit. When I saw Horton glassy eyed on the ice, I thought the Bruins where done (see Krejci going down in Flyers series last year and the Bruins losing 4 straight). But, so far, the Bruins have stayed strong. Rising above and having other players pick up the slack, the Bruins have put together 3 great games while outscoring the Canucks 12-2 since the hit. I love that Rome has come out and said he is upset about the suspension. Dude, Horton passed the puck, I got up and took a dump, grabbed a beer, called my Mom and THEN you delivered that hit! 4. 1 Win. One is all the Canucks need, but they better come to win it tonight cause they do not want a game 7. The Canucks will have shaky legs if that is the case. Every game in Vancouver has been decided by 1 goal, while the games in Boston have been blow outs. Boston travels well and plays the Canucks tough at home. 5. MVP. I think if the Canucks win the cup tonight, the Conn Smyth needs to go to Burrows. He has been amazing throughout the playoffs, scoring key goals and being the energy leader. I know they want to give it to some big name player, but seriously it should go to Burrows, or frig maybe even Torres. If Boston ends up taking it, it's Thomases and Thomas alone. Start tonight for Star Selector?